Established in 1892, the University of Reading is ranked among the top one percent of universities worldwide. 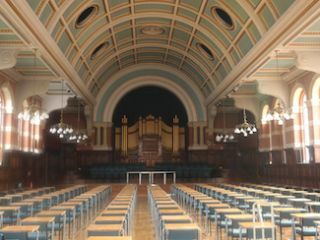 Its Great Hall, located on the University's original London Road campus, hosts a wide variety of events, including graduations, convocations, and other ceremonies. The massive hall's 80-foot (25 meter) curved ceiling and highly reflective acoustics have long been problematic, with spoken word intelligibility a challenge throughout most of the room. The building's protected historic status, however, has limited options for addressing those issues. Above: The Univesity of Reading's Great Hall's curved ceiling and protected historical status made high-clarity audio difficult to engineer. Below: The Renkus-Heinz Iconyx loudspeakers create tightly focused beams of sound, making them ideal for this challenging setting. After many years of struggles and complaints, the University's vice-chancellor consulted with UK audio distributors Polar Audio for recommendations on improving the situation. Integrators Snelling Business Systems were brought in to create an audio system centered on Renkus-Heinz Iconyx digitally steered array loudspeakers. Iconyx technology enables the creation of tightly focused beams of sound that can be directed at the audience and away from walls, ceilings, and other highly reflective surfaces. The result is a dramatic reduction in echoes and reflected sound, delivering unprecedented intelligibility to every seat in the house. The new sound system comprises just two Iconyx IC24-II-R steered array columns, with a Mackie VLZ4 1202 analog console for inputs and a Biamp Nexia SP providing system processing. As Snelling Business Services managing director Toby Wise observed, "There is no doubt whatsoever that the beam steering capability of the Iconyx loudspeakers has completely transformed the sound in the Great Hall." The low-profile design of the Iconyx systems also addressed the University's concerns regarding the Great Hall's historic architecture, with Renkus-Heinz delivering the units custom painted to blend almost imperceptively with the décor.